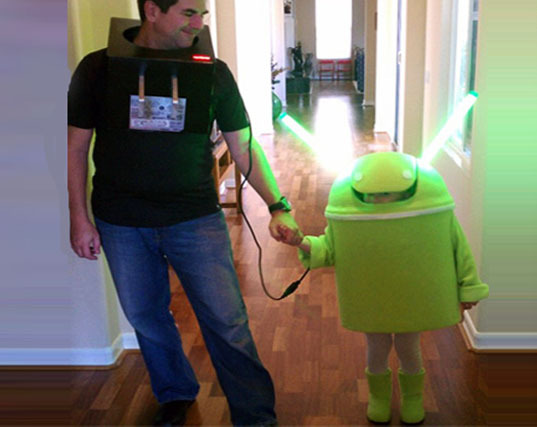 Adorable Android and Charger DIY Halloween Costume Lights Up! While most kids want to dress up as a princess or a pirate for Halloween, this sweet 4 year old girl decided that she wanted to be an Android instead! Papa Darryl made his daughter this amazing little Android costume using a trash can, a green plush blanket, felt, and energy efficient cold-cathode lamps for her antennae. But that’s not all – Dad got into the action too and dressed up as the charger! Once plugged into the “charger” the Android’s antennae lights up. If you love this costume as much as we do, vote for it in the Inhabitots Green Halloween Costume Contest! While most kids want to dress up as a princess or a pirate for Halloween, this sweet 4 year old girl decided that she wanted to be an Android instead! Papa Darryl made his daughter this amazing little Android costume using a trash can, a green plush blanket, felt, and energy efficient cold-cathode lamps for her antennae. But that's not all - Dad got into the action too and dressed up as the charger! Once plugged into the "charger" the Android's antennae lights up. If you love this costume as much as we do, vote for it in the Inhabitots Green Halloween Costume Contest!